Saudi Arabia had its first taste of opera earlier this year with a Lebanese company performing their version of a legendary love story about the fabled pre-Islamic warrior and poet Antar and his Bedouin love, Abla. It was just one more element in a dizzying parade of entertainment that has been injected into the bloodstream of the traditionally austere kingdom. It forms part of a hugely ambitious project by Saudi Arabia's Crown Prince Mohammed bin Salman - known as Vision 2030 - to shock the oil-dependent kingdom into economic dynamism. During his charm offensive in the UK, the US and now France, the 32-year-old has been seeking foreign partners to realise his vision. The Paris Opera is the latest cultural powerhouse to sign up - with an agreement signed on Monday for it to help set up a national orchestra and opera in Saudi Arabia. Plans for the first opera house in the country's second city, Jeddah, are already under way. 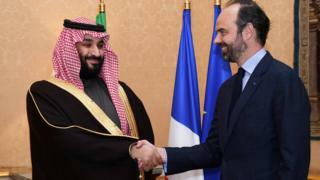 Saudi Arabia's minister of culture announced another initiative after meeting his French counterpart; Saudi short films will this year for the first time be entered in the Cannes Film Festival. It comes as the first cinema for decades is due to open in Riyadh this month, with a home-grown film industry emerging, too. But the biggest cultural deal being signed in France is an agreement for the French to help transform a huge chunk of almost uninhabited land into an immense outdoor museum. The plan is to use it to house the country's archaeological treasures, including prehistoric drawings, the remnants of the Hejaz railway - which ran from Damascus to Medina and was famously attacked by TE Lawrence during the Arab Revolt - and Madain Saleh, which is a compact version of Petra. Saudi Arabia said in February that it would invest $64bn (£45bn) in developing its entertainment industry over the next decade. It is all a huge turnaround from the days when Saudi Arabia's pre-Islamic past was all but taboo and its religious police would bar any public performance of music - whether Arab classics, jazz or opera. Saudi Arabia: Has the rate of executions doubled?